Obituary – Faw Faw, Louis « Perry High School Alumni Association, Inc.
Louis Faw Faw, a life long resident of Oklahoma, passed away Sunday, Nov. 27, 2016, in Noble, Okla. He was the grandson of William W.A.-NO-SA Faw Faw, Lucy Missouria Chief Faw Faw, Victor MI-STE-KE Dupuis and Lydia NO-GRA-ME-CHILDS, great-grandson of Louis Bernard Faw Faw, ME-HUN-THA-GA, Fredrick Dupuis. Louis was born April 11, 1925, the son of Louis Morgan Faw Faw and Edna Dupuis Faw Faw. A funeral service will follow the traditional noon feast at Otoe-Missouria Tribal Cultural Center with Jimmy Kenner officiating. Burial will follow in Otoe-Missouria Tribal Cemetery under the direction of Grace Memorial Chapel. 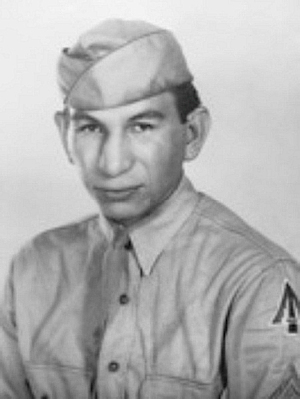 Louis joined the United States Army during World War II at the age of 20 where he served as radio code and voice operator in the 755th Field Artillery Battalion, 10th Armored Division (known as the Tiger Division), part of General Patton’s famed 3rd Army. Just before his battalion shipped out to the front, he took leave to marry his high school sweetheart, Marie Scott, on Dec. 25, 1943 in Waynesville, Mo. Survivors include his wife, Marie, of 73 years; his daughters, Sharon Luttrell, of Noble and Sandra Faw Faw, of Norman; one son, Steve Faw Faw, of Edmond and was preceded in death by three children, Susan Blair, Shelly West and Stan Faw Faw. Also surviving are grandchildren, Shane Faw Faw, Shawn Luttrell, Sharise Wingfield, Donna Swartz, Helena Jacobe and Jacob Faw Faw; great-grandchildren, Sarah Faw Faw and Lindsay Faw Faw and many nieces and nephews from his beloved siblings, six of whom have preceded him in death. The family has suggested memorials to the Otoe Baptist Church in Red Rock.